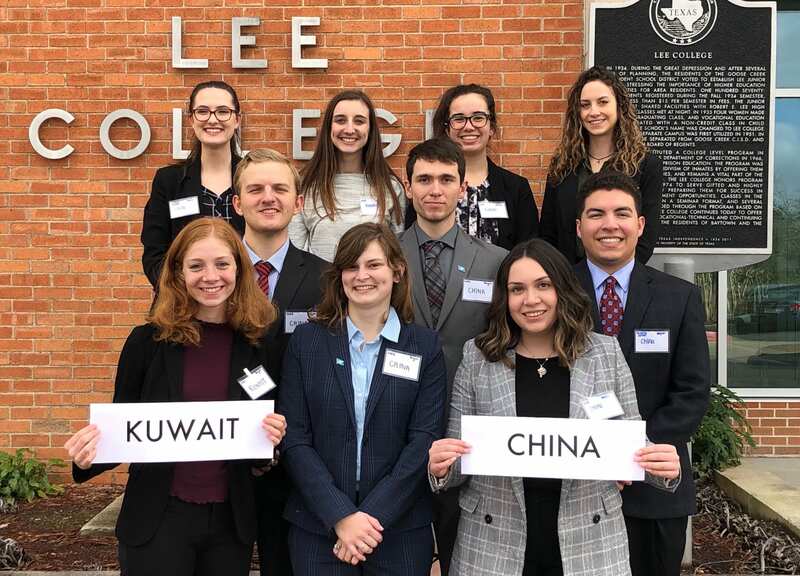 On Feb. 1-3, 2019, the Baylor University Model United Nations team participated in the 5th Annual Texas Model United Nations Conference. The Osgood Center for International Studies facilitated the conference and Lee College in Baytown, Texas, hosted it. The event brought together approximately 100 students who played the role of diplomats in simulated sessions of four United Nations committees: General Assembly First Committee, General Assembly Second Committee, General Assembly Third Committee and the Security Council. At the conference, 10 Baylor students represented the member states of China and Kuwait. While awards are given at Model UN conferences, they are not properly called competitions, as the emphasis is on collaboration as the delegates work together to reach consensus on resolutions. Model UN conferences confer awards on delegates and teams to recognize excellence in both preparation and participation in committee, and at TexMUN the awards are based both on staff and peer voting. We are delighted to share that at TexMUN 2019, Baylor students received multiple awards at both the team and individual levels, including Outstanding Delegation Awards in every category — staff, peer, and position paper. A full list of award winners is shown below. In addition, we are proud to recognize Eric Vining, a 2016 Baylor alumnus who served as a chair at the conference in GA 1. For more information about the conference, visit the Osgood Center website. Baylor Model United Nations benefits from the generous support of the political science department and the College of Arts & Sciences at the University. The team and I would like to thank all of them for their encouragement and support of the students’ research and participation in these conferences. In April 2019, Baylor MUN will travel to New York City to participate in the National Model United Nations Conference, representing Ukraine. The team would also like to thank and recognize Christopher Ruiz, Ph.D. student in the Department of Political Science, who traveled with our team and assisted with coaching at the conference.